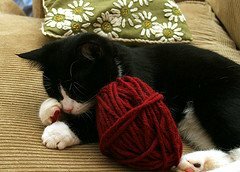 This is a review of the best cat toys, but with a unique twist, they’re all cat recommended. I love to watch my fury children play. Felines will only play when everything is right in their surrounding world. When my cats grab a mousy out of the toy box I know I’ve done my job and created an environment of happiness and well being. I’ve bought my share of interactive cat toys in the last decade. Most flopped and got no attention, like the thing in the bag toy. 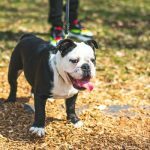 We designed this page to help pet owners reduce the failure rate. Avoid wasting money on pet toys that are more interesting to people then to cats. First up is one of my cats favorite toys, the mighty Bergan Turbo. This toy has been around for a long time and is very durable. It must have been developed by a feline scientist. The Burgen Turbo Scratch is a heavy duty plastic, large 16″ circular shaped toy with a ball that rolls around an outside track along the edge. It’s very simple, durable and yet highly effective. I don’t know why, but this has been a success with every cat we have. They use it about 3 times a week and when one starts playing the other two run in to see what’s going on. Then we run in to watch all the fun. This interactive cat toy not only has fast action, but also makes a little bit of an attractive noise as the ball shoots around the ring. The faster the cat bats the ball the more noise is generated. For this reason I would not keep it in the master bedroom. It’s two toys in one, because it also has corrugated cardboard in the middle for clawing. I remove the cardboard center and sprinkle the included catnip under it to attract the cats. Just above on the right is a picture of my girl cat Riley, using her favorite interactive cat toy, the Burgen turbo scratcher. From reading the reviews on the Amazon website people and felines are very happy with this long lasting heavy duty product. You can also purchase replacement centers, but remember they are two sided. You can flip it over when one side gets worn out. You can also freshen up the cat nip on the corrugated cardboard to keep interest in the scratching function. Some cats really enjoy digging their claws into this type of material. Another big hit with my cats is the large sized interactive cat toy known as the Smart Cat Peek a Prize Toy. Cats find it challenging to poke and prod at holes and secret spaces. Especially when they know something fun is hiding just out of their line of sight. This gets the whole hunting instinct to come to the surface. My cats like when we drop a mousy or bouncy ball inside. But many fun sized cat toys will fit inside the box. 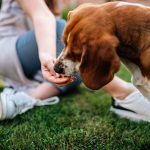 Or if your pet is motivated by food, drop a few treats inside. Challenging the cat is always a sign of a good cat toy. We purchased the smaller sized one at first. Our cats tried it but did not stick with it. The small size and lack of weight made it move around a lot. We then bought the heavy duty wood box version, the cats seem to use it much more often. If you have carpets you might be alright with the smaller sized knock offs. But if you have bare or hard surface floors I recommend the real wood larger sized cat toy box. The peek a prize has enough weight to hold it steady while your cats attack it. This is another toy that will last a very long time. It’s heavy duty and there are no wearable parts. The hardwood is nicely finished also. Bookmark this often updated best cat toys page or share with a friend. I try to provide real pictures of cats in action using their favorite and highly recommended interactive cat toys picks. It’s not always easy to snap the perfect picture of my cats in action with their favorite toy. I have also included some five stars rated interactive cat toys from Amazon’s best seller list. The nice thing about Amazon’s website is that people who own the items provide the in-depth reviews. This gives you an idea of how the product will work before you purchase it. In some cases you get many helpful reviews. On the left is an updated version of a toy we use to call the crazy circle. 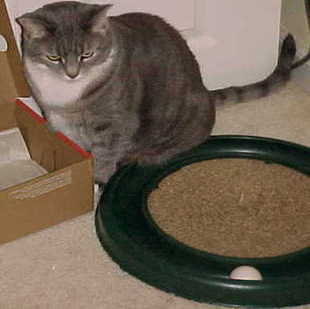 This is a kitty ball chase game that my cats find fun and challenging. To me it seems to work on the same principles as the Turbo but my cats find it unique. Below are even more cool cat toys. I went through hundreds of different products in the pet toys area. 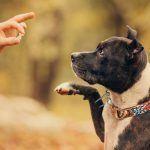 I went through the reviews and selected the best cat toys recommended from real pet owners. Click on the item or picture to review the comments on each. My cats, made me buy them these cat toys and I can’t return them now because there’s spit all over them. To review the most used toys in our home are the Bergan turbo scratch, the peek a prize and the crazy circle. My cats have voted them as the best cat toys available. Note: your results may vary and your cats might disagree with mine. What about kittens can they play with stuff your full grown cat plays with? I don’t think so. 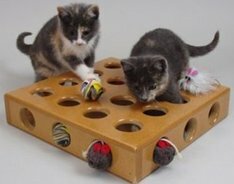 Find out why and some safe toys for kittens. Ever wonder what the deal with catnip was? Did you ever wonder if it’s safe. I try to answer this question on my page titled is catnip safe. What do you do if you buy a bunch of toys and kitty doesn’t play with them. 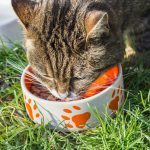 Well here’s some ideas if your cat isn’t playing at all. 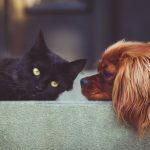 If you would like information on common cat health problems and would also like to visit the most popular page on this cat behavior website the next link takes you to answers for cat health problems. When it comes to books about cats there are lots to choose from. We prefer the online PDF. See our picks for best cat books online and paper.